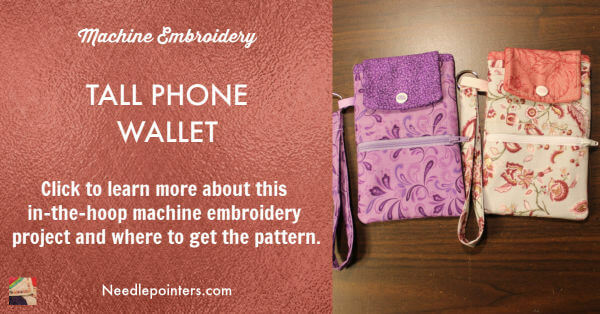 This Tall Phone Wallet project is completed in-the-hoop with an embroidery machine with a pattern available from Embroidery Garden. See below for a link to purchase the pattern and supplies. Chris at Needlepointers.com has made several of these wallets and has given several as gifts. She keeps her main identification and cards in this wallet along with her money. This way, if going on a quick errand, this wallet can be taken out of her purse and have everything she needs. Watch the video to learn more about this project. 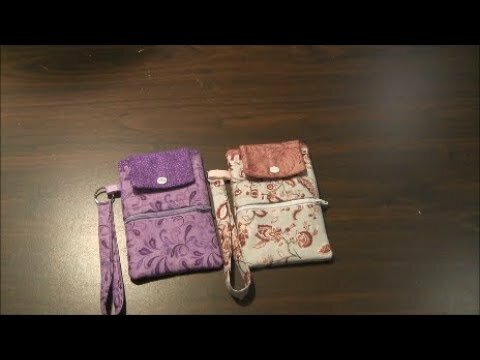 Click to watch the Machine Embroidered Tall Cell Phone Wallet video in Youtube. The taller wallet features several slots to hold credit cards or identification, a zipper pocket to hold money and change and a larger back pocket to hold your cell phone. It has a wrist strap for easy carrying. The inside seams are completely finished so there are no raw edges inside the back pocket or the change/money pocket. This will hold the Iphone 6 or 7 (not plus sized phones) or another similarly sized phone. I have an Iphone 7 and it fits comfortably inside the back pocket even with a case on it. Unforatunately, wider phones like the plus sized phones would not fit into this case. It should fit other manufacturers phones also which are similarly sized. The pattern is from Embroidery Garden and they include a full PDF step-by-step tutorial to guide you through the entire assembly process. From cutting and labeling each fabric piece to each step in the embroidery process the PDF will guide you. This is a fun in-the-hoop project. The main bag is completed in your machine embroidery hoop and when it is popped out of the hoop and turned twice, you have a completely finished and lined wallet. 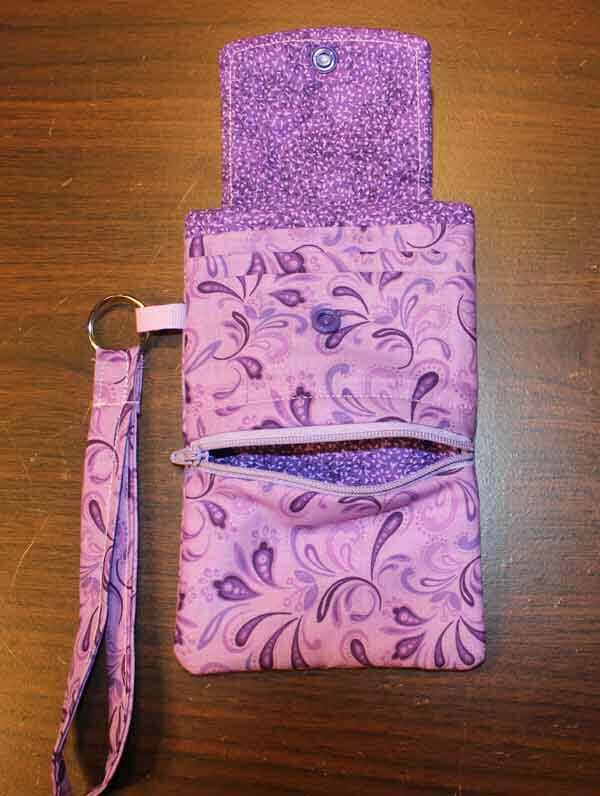 The wrist strap is sewn separately and attached to the wallet after it's finished. There are two embroidery files for this project. The first file is to embroider the flap and it comes in a narrow and wide option. I like the wider flap as it covers the credit cards and identification more completely. Once you've machine embroidered the flap, then you sew the flap to the two back pocket pieces. This is one other step that is done outside the hoop and with your sewing machine. The second embroidery file is for machine embroidering the wallet itself. The bag is embroidered by following the steps in the PDF instructions. It is important to label your fabric pieces as they are cut out as those labels are in the later instructions. The wallet is assembled by placing the fabrics in the hoop as instructed and stitching each step. Read the directions carefully because it is easy to miss a step. 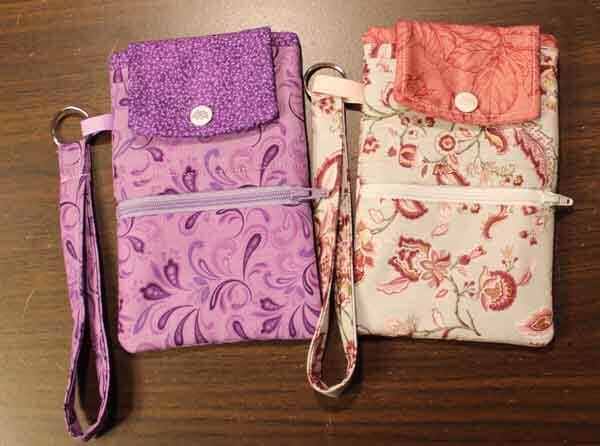 After all of the steps are completed, you will be amazed once you pop the wallet out and turn it twice to reveal the finished wallet with fully finished inside seams. This shows the fabric I selected for the inside of the wallet. Embroidery Garden also has excellent customer service and a Facebook Group where you can get tips and help if you get stuck on this project. I have done many of their projects and they are well digitized and their PDF instructions are are complete and make it easy to finish the project.